Wow. Did that really happen?! As I sit at home writing a race report, ravaged with a cold and a cough from stressing my body, I’m still having a hard time believing it. 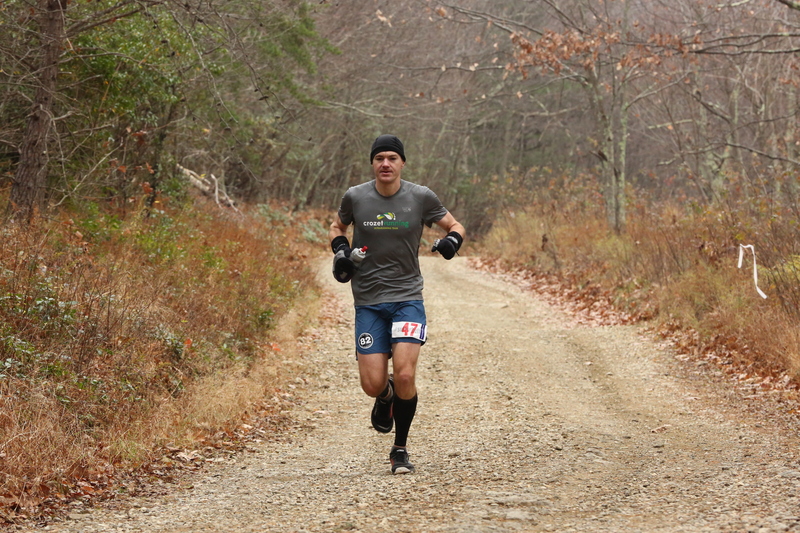 6th place at the Mountain Masochist 50-Miler in 7:59:22. Top-ten at Masochist! I have quite literally never worked harder for something in my life, both during training and during the race. And though this race was very important to me, it means nothing compared to my family, yet having my family there through the voyage and throughout race day has brought us all closer together and gave me a new sense of gratitude for having them in my life. My love affair with Masochist is short and sweet. 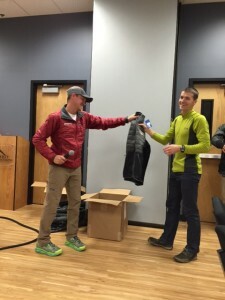 It was my first official ultramarathon one year ago and between the prerace banquet, the course, the after party at Montebello, and the post race awards dinner, I was blown away. What a community. What a course. What an event. 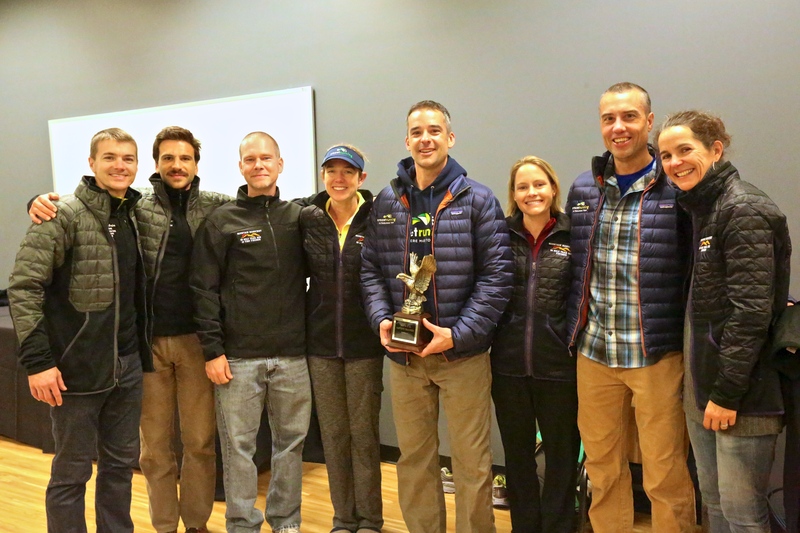 What an awesome group of runners. And all the crazy fast runners! Look at them all getting their top-ten puffies at the awards ceremony! What amazing humans they are! I was in awe of Masochist and everything it represented. After a hard-earned 9:03 finish last year, I knew I’d be back. My buddies and I instantly started joking about how when the day comes that we get top-ten puffies at Masochist, we can pretty much retire and stop running. At the time it felt like saying “If I ever get to be QB of the Dallas Cowboys…”. A dream goal for sure, but too big to start worrying about anytime soon. This past year has unfolded quite magically. Since last year’s MMTR I have worked incredibly hard, transformed myself as a runner, and changed my expectations. 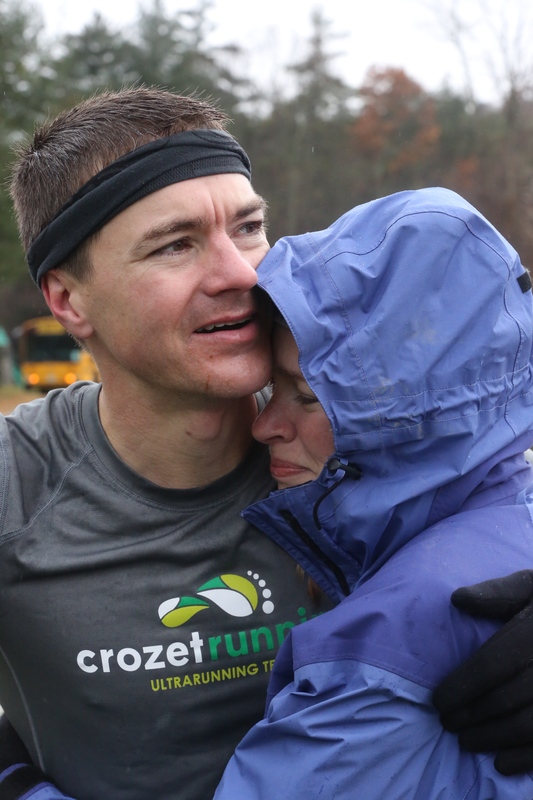 As David Horton told me after this year’s finish, “Things happen for a reason, both with God and with running. You did the work.” Yep, I did do the work. But I’m no prodigy or 4:15 miler. I’m a 38-year-old father with two jobs, too many other obligations, and not enough sleep. But I’m determined, and determination can be a very powerful thing. that day” training plan. I never want to push myself or limit myself by following any sort of formal training plan. Training is so dynamic. Good days and bad days, epic weeks and off weeks. Hellgate, 2013 – 17 hours of cold, snow, rain, and wet feet. I was undertrained but finished on pure optimism and perseverance. I learned the power of the right mindset. I was definitely not fast. 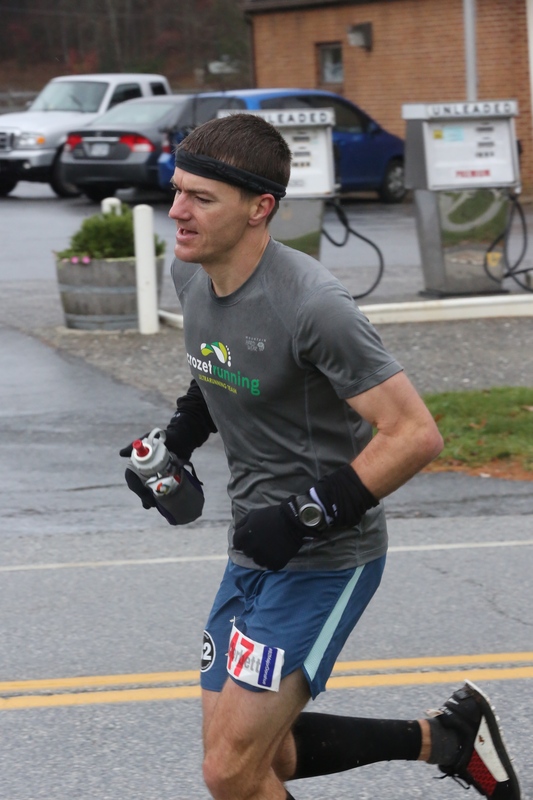 Then I decided to enter the Lynchburg Ultra Series, which starts with three spring 50Ks, and finishes with Masochist in the fall. Holiday Lake 50K – Hoping for a top 40 finish, I surprised myself with a 13th place finish in the deep snow, rain, and mud. I learned that I kind of like these “grinder” type races that most people loathe. 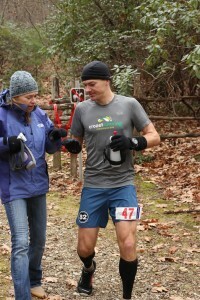 Terrapin Mountain 50K – I went big in this race, probably going out a little too hard, but hung on for a 15th place finish. I learned how to close when it hurts. Promise Land 50K – I started conservatively and was able to turn on the jets around mile 22 finishing in 17th place in a deep field. I learned patience. After Promise Land, my focus for the first half of the summer was just getting in miles comfortably, but still putting in some speed work here and there. On one particular tempo run, I strained my right calf/Achilles. This sooo wanted to turn into Achilles tendinitis, but I dialed it back for two weeks, patiently waiting it out. I did not get anxious about losing fitness, and the next week won a local 5k – go figure. 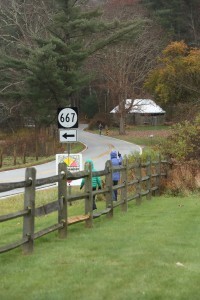 Catoctin 50k – Then came Catoctin. I came into Catoctin feeling pretty good about my fitness. I had no injuries and was training at will. My body seemed to be handling anything I threw at it. I heard the course was super rocky, which I thought actually favored me because I for some reason love technical trail and per Holiday Lake, seem to be a good grinder. I began to think that I could do quite well here and come race day decided to go for it. I started out with a harder effort than I usually do and found I was able to maintain it. At the turnaround, a new switch got turned on in my head and I passed the then leaders and out-ground everyone to a solid win. I learned to run with confidence. I began to see Masochist in a different light now, but still, three months before the race, the idea of cracking the top-ten seemed like a multiple-year investment. Still, with some newfound confidence, I decided to really pour into the next three months of training and see what I could do this year. Masochist became my daily focus. I literally thought about the race on every single training run and workout. The week after Catoctin, I ran the JIM (Jarmans Invitational Marathon) and the next morning woke up with a bruised and painful right foot. Crap. Stress fracture. I couldn’t hop on it. Well, Catoctin and the JIM were worth it, I told myself, and I somehow tried not to dwell. I wore hiking boots and didn’t run for the entire next week. My first run back was bad, I was clearly favoring this foot. Crap. Not to be dissuaded, I found a few pairs of shoes that least offended the hotspot and continued to run really slowly for short distances. If it is possible to have a stress fracture and have it healed in three weeks, that was me because three weeks later I was back and feeling refreshed! Throughout my training, I have had the pleasure of getting some sage advice from some really terrific and wise people. Greg Loomis, Andy Jones-Wilkins, and Sophie Speidel – all friends, and all amazingly experienced. I soaked up their wisdom like a sponge. Most influential however was David Horton. This amazing person took the time to go over my training and pick out a few things he thought would really help me out, specifically mile repeats and doing all my long runs alone. When he asked me my goals for MMTR, I shyly said that one day I’d like to be top-ten, but quickly brushed this off saying its probably gonna take me a year or two. Horty didn’t agree or disagree, he just told me to focus on the training and do the work. “You can get faster, if you do the work”. That stuck with me. The next 10 weeks were the most organized I have ever been about training. Mile repeats every Thursday night. Long runs once or twice a week – usually alone. Very specific recovery days and recovery runs. Sunday tempo runs. Each week was taxing on my body and I was clearly riding right on the line between injury and performance. Mile repeats started getting faster each week. Sometimes by 10 seconds a week. Some of this gain was from the training, but some of it was unlocking the mind – wanting it more, working for it more. “If you can’t earn it in training, you’re not going to earn it on race day” was another Horton quote that stuck with me. While building up, I was still respecting my body. Looking at my mileage, it was interesting to see that I’d have a 70-mile week, then a 30-mile week, then an 80-mile week, then another 30-mile week. I was just going by feel, but was finding that a week is a pretty narrow scope to look through regarding your mileage. Take it when it comes, but rest when you need it. Two weeks before race day, mile repeat night. I had gotten my fastest mile to 5:12 a few weeks prior. When I showed up at the track that night, I decided I was going to try and break 5:00. Its funny considering how these mile times could possibly correlate with a 50-miler time, but I knew that the 12 seconds I needed to shave off were all in my head. I almost bailed on the sub-5 goal right before starting, questioning if I had it in me to commit to how hard it was going to be. Then I thought about Horton, and I just thought, “I belong”. 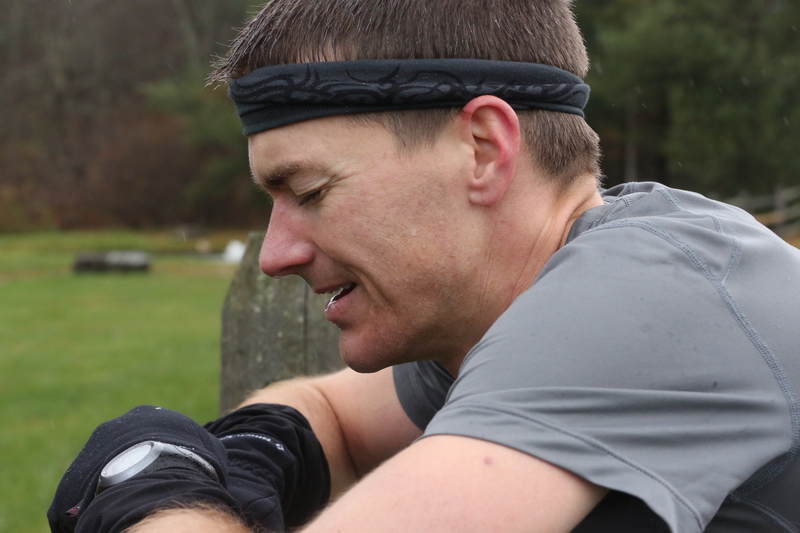 It was a statement workout – did I have what it takes to lay it all out there in training, or was I going to take the easy way out, something I might repeat in a race…. I flipped the switch and tore off down the track. As always, the first lap is just getting your breathing and your bearings straight. The second lap is where I really find my pace, but is also where my legs start to tire. The third lap is always the worst lap – you’re so tired, yet so far to go. But to break 5 minutes I had to kick it up here. My lungs were burning and I thought that lap would never end. The fourth lap is just what you have left, both legs and mind. I was almost having an out of body experience I was redlining so hard. As I tore down the last straightaway, my vision blurred, my gut started cramping, my lungs were on fire….and then my watch beeped…”4:58”. It was 9:30pm on a Thursday night. I was ready. The next two weeks of tapering drove me nuts. I had Masochist dreams every night. I knew it was stupid to be so emotionally invested in a race, but my mind would do nothing else. I let out my frustrations with a 6-mile tempo the Sunday before the race and then shut her down. Hay is in the barn, let see how long it’ll burn! My race strategy for Masochist was to go for it, but to be smart. Part of being smart was a little planning. I had researched previous years’ 8-hour finishers and wrote down some splits that I probably would need to hit along the first 3/4ths of the race. I also paid attention to some runners with whom I would probably latch on to for the beginning of the race to help set that pace. Jordan Chang, Jack Kurisky, Frank Gonzalez – stick with these guys early and you’ll put yourself in position. It was cold, dark, and rainy at the 6:30am start and we were off! There was a lead group of 3 guys who just sped off right away, and then there was our “realistic” lead pack of about 20 runners who all put in a good effort for the first few miles as the field of 400 runners thinned out. The pace was fast, but not unrealistic – 7:30 minute miles for the first 2 miles. So much for starting slow – but you don’t break 8 hours starting slow…all in, right?! We settled in and after the first deep stream crossing, our pack of 20 started to thin out a bit. I was probably hanging right at 20th for the first 10 miles, and when I saw Horton riding his bike near the Dancing Creek aid station he said “You’re right where you need to be!”. I responded with a confident “Yep!” and carried on, arriving at Dancing Creek 1 minute apart from my estimated split time. I had filled my bottle at Peavine Mountain so at Dancing Creek AS I didn’t stop at all, allowing me to blow right by about 5-6 runners. Next thing I know, I was running with Frank Gonzalez and Sam Dangc, two top-tenners from last year whose splits I had studied. Now the reality of what I was trying to do set in. 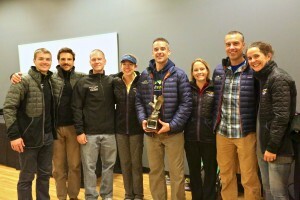 Like every ultra race, we had some great, real conversation about life as we ran together. Frank shared how he used to be really overweight and how the first time he ran Masochist was right after his brother had died. I could feel the emotion. I shared my 8-hour goal and Frank looked at me and said “Hey man, you’ve got 8 hours in you today. I know it”. We don’t really know each other, but he said it like he meant it and it affected me. Love this community. At Mile 15, Parkway Gate AS I got to see Michelle and Whit and our friends Jena Spearin and Steve Rosinski for the first time. I was still just 1 minute behind my projected split and somewhere around 12th place. We switched handhelds and I was off in 10 seconds. After a few miles of climbing, we came to the long, 5-mile decent into the Lynchburg Reservoir. Last year, it was here that I knew I was in for a long day and its here that Masochist chews up a lot of eager runners. 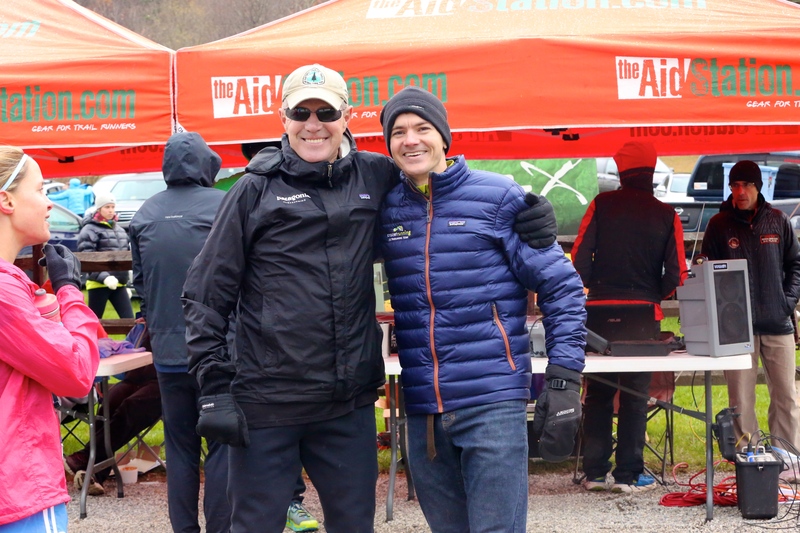 And here I was in a pack with several of last years top ten, and about 8 other super talented runners including Ryan Paavola and Nick DiPirro. We all ran solidly together for the entire 5 miles. I felt like I was pacing the big kids, and just focused on running my own race within my own limits. At the reservoir AS (Mile 22), I only needed water in my bottle and I blew through in about 5 seconds and started the 4 mile climb to the halfway point, Long Mountain AS at mile 26. I just focused on finding a good climbing gear and grinding this out – I had actually practiced this a lot in training – long, grinding climbs, which is what this was. I recall really hurting in this section last year, so it was nice to have climbed it so strong this year. 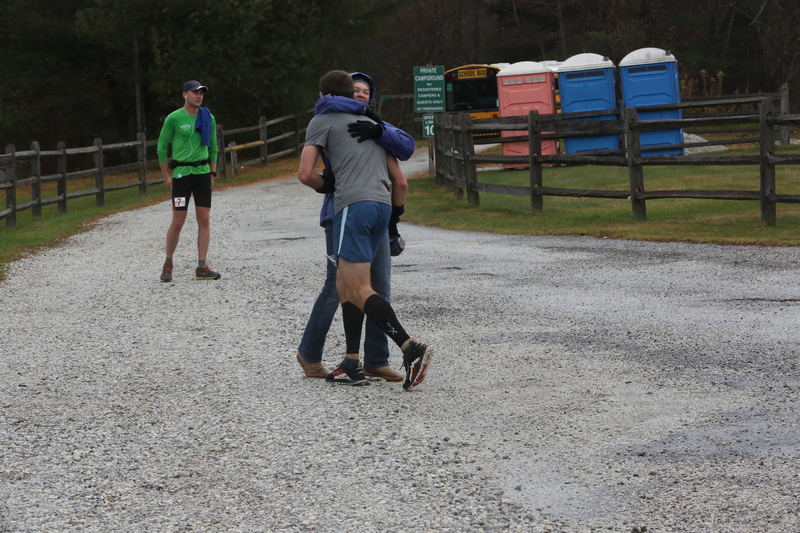 I came into the Long Mountain AS and found Michelle and Jena – it was always so great to hear Michelle’s voice cheering and encouraging me from so far away – I could tell she was so relieved and excited to see me – now 2 minutes under my split times – and I was energized by the meet up. She shoved me my bottle and I asked what place I was. Jena answered, “You’re in 8th place, but if you leave right now, you’ll be in 6th!”. I was gone. Running in 6th place at Masochist?! What’s going on?! 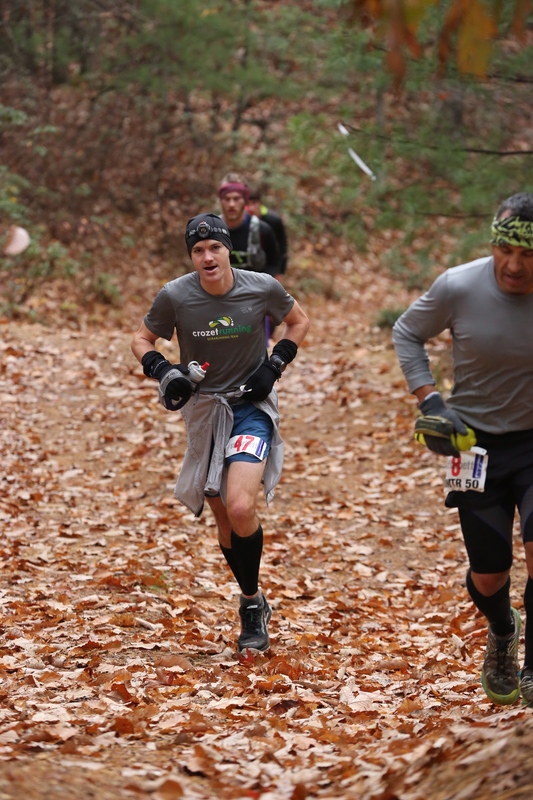 As I started the grueling 3-mile climb up Buck Mountain, the longest and biggest climb of the race, I truly began to race in the top ten. I knew there were a bunch of fast people behind me still, but I was feeling good and had really practiced these grinding climbs all summer. Sure enough, about a mile up, Mike Jones (eventual 4th place) passed by me. The wind really started picking up now and he was only wearing a short sleeve shirt. I kept my arm warmers up, but just kept running to keep warm. Ok, 7th place then. Just maintain this to the loop, then “whatever it takes”. Just as I was about to reach the top of the mountain, I saw a runner limping badly and hobbling to the aid station. Getting closer, I could tell it was my friend Anthony Wind, the 5 seed who was one of the top three starters. I could tell his day was over. As I caught up, he told me his hip flexors were blown and he couldn’t lift his legs. What a bummer. I exchanged some words of encouragement, but otherwise kept grinding it out. Ok, 6th place again! I was able to maintain this place until I reached the Loop, at mile 33. I knew there was a runner not too far behind me (dang cheering aid stations! They were only supposed to cheer for me! ), but I could also now see a runner way ahead of me, but who was walking where I knew I’d be running. I saw Michelle, again exchanged bottles and she told me Gary Gellin was only 2 minutes ahead and that I was totally going to catch him. That got me fired up. Sure enough, about a mile later, I caught Gary on the rocky, steep climb of the loop. 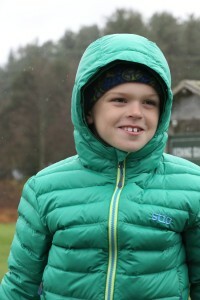 He was having a lot of trouble with the cold (it was now around 30 degrees with wind chill) and “body malfunction” – this would be many a runner’s story that day. Everyone I talked to was all crampy from the cold and windchill, me included. Ok! 5th place! OMG, I’m running 5th place at Masochist with 15 to go! Sure enough, not 5 minutes after catching Gary, Ryan Pavola passes me. “Its ok”, I told Gary, “Ryan was supposed to be ahead of me way back there, order is now restored”. 6th place. Still feels good. We climbed strong to the top, punched our bibs and headed down. 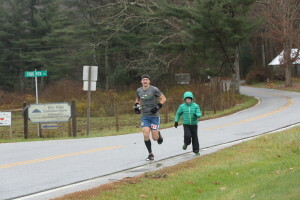 I quickly caught back up to Ryan and unfortunately started seeing some other runners on the out and back section of the loop. Frank, Sam, Nick, David, Dylan…lots of talented runners all coming after me… There would be no rest. Another Horton tip was that once I reached the top of the loop, I needed to get tough and tell myself “Whatever it takes!” I gave myself a few pep talks, but really just more groaned out as I tried to open up the legs a bit. I managed to catch Ryan and pass him on some downhill and was now running alone in 5th place again. As I approached the loop AS again, I started feeling strong. Maybe it was the GU I was forcing down (which truthfully, I was almost vomiting back up…), but more it was here I remember last year feeling my lowest point in the race. Like many a runner, I went into the loop, got chewed up and spit back out when they saw me. 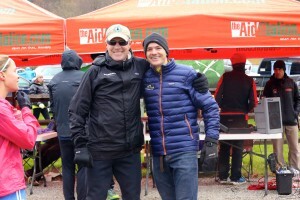 This year, I stormed into the aid station in 5th place and gave my son a “Boom!”. Quick change of bottles, changed my hat for a buff (would not have done that had I known how nasty the weather was about to get), and Michelle handed me some Tylenol. As I came into the loop, I told her to get some ibuprofen ready for me. I probably freaked her out a bit because I never take pain meds during a race and am kind of against it. Yet my muscles were just hurting and I was looking for any help. When she put the Tylenol in my hand, I gave them back and said never mind. My mind went back to listening to Anton on a podcast saying he doesn’t take pain meds because “the pain is part of the race experience”. Yep. I earned this. No pain meds, lets go! At this point, I was listening and hearing every word Michelle, Whit, and Jena said to me, but I couldn’t really talk or focus my eyes much. I vividly remember Michelle say: “John, this is your race. Your 5th man. Now go kill it! Whatever it takes!” This was contrasted by my sweet son dancing around my legs saying “Daddy I love you! I love you!”. These words repeated in my head for the next two hours almost constantly, kept me focused on the task at hand, and gave me strength. I hit the downhill out of the loop as hard as I could and just did my best to grind up the brutal climb of Salt Log Gap. Pretty sure that’s the steepest climb of the race, and I’m pretty sure I hiked most of it. I knew Ryan couldn’t be too far behind, and I was expecting to see Nick DiPirro any moment. These guys are way faster than me, but this was truly just a test of who can grind it out. Heck, I was pretty much envisioning a crew of 6 fast guys overtaking me and putting me into 11th place. Seriously. Can’t let that happen! Whatever it takes! At the top of the Forest Valley climb, the weather just started to unleash. Here the course rolls along a ridgeline for about 4 miles and there was some crazy sideways wind that soon added a healthy amount of snow and sleet into the sideways mix. I couldn’t believe trees weren’t falling over. Out of the blue, Ryan caught me. We both encouraged each other and gave estimates on our gap of the guys behind us, then he was gone. See ya 5th place, it was fun! With about 5 miles to go, I saw Horton riding his mountain bike up the course from the finish. Succinct and to the point, he yelled “6th man. You gotta MOVE to get 8 hours!” and rode right by. I felt like fainting. Literally. I had been grinding it out in freezing weather for so long and the little rolling uphills in this section were almost breaking me. I would at times start to feel dizzy as if I might pass out and have to slow down…To hear someone tell me to hurry up was almost more than I could bear. After Horton passed, I gave a dying “huuuuuhh” and I struggled up the last 1% uphill grade climb and finally reached the Potters Mountain AS – 4-5 miles of sweet downhill to the finish. Don’t get me wrong, I was still hurting and was still envisioning the pack of 6 guys right behind me, but I knew I could climb no more, and my quads were feeling great. At this point, I just tried to hold it together mentally, physically, and emotionally. As I ran down some of the big switchbacks, I looked back up the mountain and saw no one. That’s when it hit me, I was going to be in the top ten, and very likely 6th place. Wow. Hold it together. Keep pushing. At this point I remember telling myself I didn’t give a hoot about going sub-8. It’s been a brutal day running into the wind, top-ten is sublime! Finally the gravel road. The first time I was ever on this road I was on a hike with Michelle and Whit when he was younger. It was a great day. What a great memory to have as I descended down the road, past the knobby tree, and past where we saw a bunch of butterflies as a family. Then the “1 mile” marked in the road. I looked at my watch – 7:52:17. “Crap” I said as I realized I could make sub 8 hours if I can just manage to pound out a 7:43 mile. I laughed a lunatic’s laugh and kept pushing. I looked down at my watch 30 seconds later and it had shut off. Whoa. I can’t believe my watch made it only exactly long enough to motivate me for this last mile, and then it died. I pounded by the fish hatchery, and made the left hand turn onto 56 and its painfully not-downhill grade. But I could hear the finish. Then from a distance I could hear and see Michelle. She had her finger in the air and was jumping up and down screaming “1 minute! 1 minute John!”. Ugh. She looked so far away! Here’s where the mile repeats came into play. 4th lap, all that’s left. 7:59:22. When I crossed the finish line, I found Michelle and just hugged her. The day, the training, the commitment and sacrifices – they all hit me and I knew I could have never done it without her. That was the emotion. Gratitude for my family and my friends. Thank you to my friend Jena Spearin for taking all these great pictures! Whit running me in. Love this. Me and David Horton. Thanks Horty! CRUT Swag. Lots of puffies. Even a trophy! Love the emphasis on family! Y’all are incredible. Now have my eyes set on hurting myself again this fall! Haha! But seriously, congrats on an incredible race! 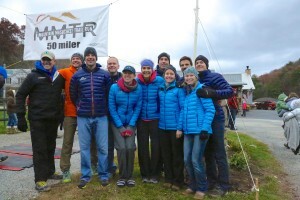 I’m gearing up for my first MMTR this coming November and have been obsessively reading race reports for anything that might help me get through it. This is an incredible story and so well-written. I’ll be chasing 12 hours instead of 8 hours this year but I feel like this is all the inspiration I need. Congrats!